Part 1 General: Introduction; The development of creep-resistant steels; Specifications for creep-resistant steels: Europe; Specifications for creep-resistant steels; Production of creep-resistant steels for turbines. Part 2 Behaviour of creep-resistant steels: Physical and elastic behaviour of creep-resistant steels; Diffusion behaviour of creep-resistant steels; Fundamental aspects of creep deformation and deformation mechanism map; Strengthening mechanisms in steel for creep and creep rupture; Precipitation during heat treatment and service – Characterisation, simulation and strength contribution; Grain boundaries in creep resistant steels; Fracture mechanism map and fundamental aspects of creep fracture; Mechanisms of creep deformation in steel; Constitutive equations for creep curves and predicting service life; Creep strain analysis in steel; Creep crack growth behaviour and creep-fatigue behaviour of steels; Creep strength of welded joints of ferritic steels; Fracture mechanics: Understanding in microdimensions; Mechanisms of oxidation and corrosion and the influence of steam oxidation on service life of steam power plant components. Part 3 Applications: Alloy design philosophy of creep-resistant steels; Using creep-resistant steels in turbines; Using creep-resistant steels in nuclear reactors; Creep damage - Industry needs and future R&D. Creep-resistant steels are widely used in the petroleum, chemical and power generation industries. Creep-resistant steels must be reliable over very long periods of time at high temperatures and in severe environments. Understanding and improving long-term creep strength is essential for safe operation of plant and equipment. This book provides an authoritative summary of key research in this important area. 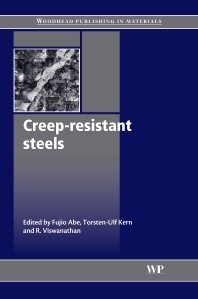 The first part of the book describes the specifications and manufacture of creep-resistant steels. Part two covers the behaviour of creep-resistant steels and methods for strengthening them. The final group of chapters analyses applications in such areas as turbines and nuclear reactors. With its distinguished editors and international team of contributors, Creep-resistant steels is a valuable reference for the power generation, petrochemical and other industries which use high strength steels at elevated temperatures. Dr Fujio Abe is the Director of the Heat Resistant Design Group in the Steel Research Center at the National Institute for Materials Science (NIMS), Japan. T.-U. Kern is a materials expert for Siemens AG, Power Generation Group, Germany, Chairman of the German Creep Council and member of the management board of the European Creep Collaboration Committee (ECCC). Professor R. (Vis) Viswanathan is Technical Executive for Materials Application at the Electric Power Research Institute, USA.